On a recent Friday evening at Seoul Station, tickets for almost every train, including standing tickets, were sold out. At the Express Bus Terminal, meanwhile, tickets had been gobbled up for buses to the coast. Such is the urge to get out of the city, and the helplessness of the transportation system to cope with the huge numbers of recreational travelers, that it’s become necessary these days to purchase tickets a week or more in advance. But ticket sellouts need not be cause for despair as a smattering of humbler getaways await the spontaneous traveler. 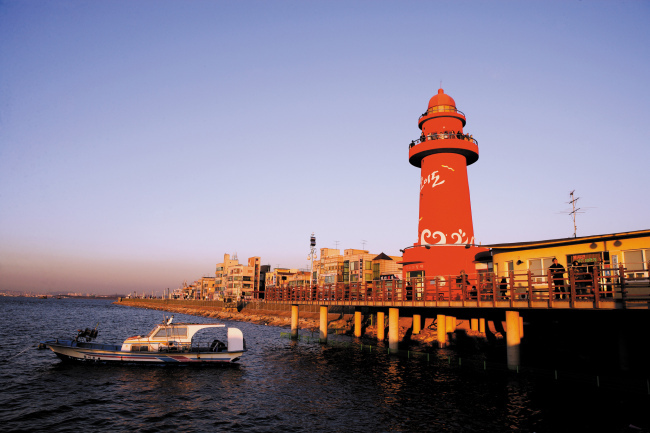 One of the easiest and most affordable to reach is Oido Island, a one-hour, 15-minute ride from Seoul Station. At the tail end of Seoul’s Line No. 4 (the light-blue line), Oido is well outside the city, without being completely out of its sphere of influence. Riding to the terminus is not a totally unreasonable proposition, as it is with Line No. 1, which drops all the way down to South Chungcheong Province. From the Oido seawall on a clear day, Incheon and the new skyscrapers of Songdo International Business District can be sized up and contemplated from afar. The Oido area is part of Siheung, Gyeonggi Province, and despite what its name would suggest, it is not an island at all. In the beginning of the 20th century, when the area served as salt flats, it was cut off from the mainland by a dike. The resulting “island” was given its current name, meaning Crow’s Ear Island, on account of its shape ― which is puzzling, since crows’ ears are simply openings in their heads. In fact, the Ocean Complex, the main draw, is shaped like a square block attached to the mainland, and bordered on its three sides by a raised seawall. Beyond this is an expanse of mudflats stretching far out to the horizon, and blocked off by a barbed-wire fence ― a security measure against North Korea. The Ocean Complex from Oido Station is at the end of the line again on bus No. 30-2, though it’s a much shorter journey this time. Near the bus stop is the start of the seawall, with a viewing platform stretching over the mudflat in the direction of Stork Rock. This is also the start of the long restaurant strip, the first section of which stretches from the bus stop to the Tree of Life sculpture. Turning here, one starts down the longest side of the Ocean Complex, which includes the main landmark and viewpoint, a red lighthouse. The final side of the Complex is the shortest, and includes a South Korean Navy vessel opened to the public after being decommissioned in 2009. In all, the restaurant strip contains about 50 seafood restaurants, some four levels high. Touts stand at the entrances shouting, beckoning cars and clapping loudly. Last Saturday, one was even wearing a tiger costume jumpsuit. Though some restaurants specialize in delicacies like short-arm octopus (jjukkumi), raw fish or seafood noodle soup (kalguksu), the main draw is grilled shellfish. The current trend is to offer “infinite refills,” though the initial amount of food is likely to forestall any extra requests. At Jogae Pocha, even before the platter of scallops, shrimp, clams, conches and fan mussels was delivered, a pan of ramen, tray of pork bulgogi, vegetable pancake (buchimgae), dish of corn, and stone pot of rice and flying-fish roe (albap) had been brought out as starters. The grilling lasted for hours, and by the time the meal was done the afternoon had passed and the tide was coming in. The shellfish was undeniably fresh ― still alive, in fact ― though the English signage was problematic, with “pocha (food stall)” translated as “gun carriage,” and foreigners referred to warmly as “aliens.” At 25,000 won ($24) per person, though, this is one of the best shellfish deals in the country. After dark, the atmosphere along the seawall grew festive, with fireworks being sold and set off, and food carts offering exotic fare like coconuts and sugar cane juice. Among the self-catering groups of picnickers and soju drinkers on top of the wall were resident aliens from South and Southeast Asia, many enjoying a day off from their industrial workplaces in Siheung or nearby Ansan. With the cotton candy and toy vendors, and the families and couples strolling the seawall, the area took on a festive, carnivalesque atmosphere after dark. Near Oido Ocean Complex is a site of Neolithic remains, while further north along the shoreline is Okgu Park, with a scenic hilltop pavilion. Wolgot Port, north of Oido Station, has a huge, visually stunning fish market, as does the Ocean Complex. Cyclists may want to ride across the land bridge near the Complex to Daebudo Island, where grapes are cultivated, and further still to Yeongheungdo Island ― a total distance of about 30 kilometers. The two beaches of Yeongheungdo may possibly be the closest to Seoul that can be reached without taking a ferry.